Newark, New Jersey— The Board of Trustees of Aljira, a Center for Contemporary Art are pleased to present a free, public event, Victor Davson: Limited Engagement, May 12-21, as part of the lead up to Creating Tomorrow, a fundraising June 23 celebration at NJPAC honoring Founding Executive Director and Artist Victor L. Davson as he steps down after thirty-three years at the helm of this landmark artist-founded, artist-centered organization. Victor Davson: Limited Engagement is a special ten-day exhibition of paintings on panel and LP vinyl record album covers and pre-publication sale of a benefit print edition by Davson. Last year, Davson celebrated his first mid-career survey exhibition at The Ramapo College Art Galleries. The exhibition spanned 30 years and five bodies of work that move back and forth between abstraction and figuration. Currently, Davson also has a solo exhibition on view at the Wilmer Jennings Gallery at Kenkeleba, 214 East 2nd Street, in New York City through May 28, 2016. Davson’s work is heavily influenced by the anti-colonial politics of the Caribbean, and by the intellectual powerhouses of that period. These include extraordinary writers and activists like Martin Carter, Frantz Fanon and Walter Rodney. Since 1996, his series of paintings and drawings, which include the “Limbo/Anansi” drawings, “Bad Cow Comin’” paintings, and his most recent paintings on long playing vinyl record album covers, are his attempt as an artist to negotiate the roots of identity in a terrain of loss and desire. All of these series are a response to his strong memories from his childhood in Guyana of a folk performance in which the participants masqueraded from house to house on Christmas Day. He sees these carnivalesque characters as metaphors for people of the African Diaspora who have survived because of their resiliency. As Executive Director of Aljira, a Center for Contemporary Art, Davson has led a vital hub for creative excellence in Newark, New Jersey’s downtown arts district. Notable highlights in the organization’s history include: the founding of Emerge, a professional development program for visual artists; the founding of Aljira Design, a graphic design studio that for eighteen years earned revenue to support the organization’s exhibitions and public programs; an invitation to organize the United States representation at the IV Biennale International de Pintura in Ecuador; a major award from the Andy Warhol Foundation for the Visual Arts—becoming one of only eight institutions nationwide selected to participate in the foundation’s second year stabilization initiative for small to midsize organizations; and designation as a Major Arts Institution by The New Jersey State Council on the Arts every year since 2003. On Thursday evening, June 23, 6–9pm Aljira’s Board of Trustees will present a special fundraising celebration at New Jersey Performing Arts Center in Newark, to salute Victor Davson’s achievements and to ensure that Aljira’s acclaimed legacy of empowering artists, creating ground-breaking exhibitions and valuable community programs will continue to flourish. The celebration is a milestone for Aljira, one of Newark’s and New Jersey’s premier cultural landmarks. Also, it is a very important occasion to express our gratitude to countless supporters that have enabled Aljira to become a beacon for creativity and free expression, serving Newark and the region through more than three decades. For information about tickets and sponsorship opportunities: visit www.aljira.org or contact Matt Brown, Creating Tomorrow Coordinator, mbrown@aljira.org. 973.622.1600. As part of the Creating Tomorrow celebration Aljira will launch an online-only fine art auction via Paddle8 featuring the work of over twenty artists, among them, Derrick Adams, Frank Bowling, Willie Cole, Chuck Close, Chitra Ganesh, Pat Lay, Mickalene Thomas and Adejoke Tugbyele. Work can be viewed beginning June 1 at www.paddle8.com/auction/aljira. Bidding will begin June 9 and the auction will close on June 24. For information about Aljira’s online Fine Art Auction visit: www.aljirafineartauction.org. 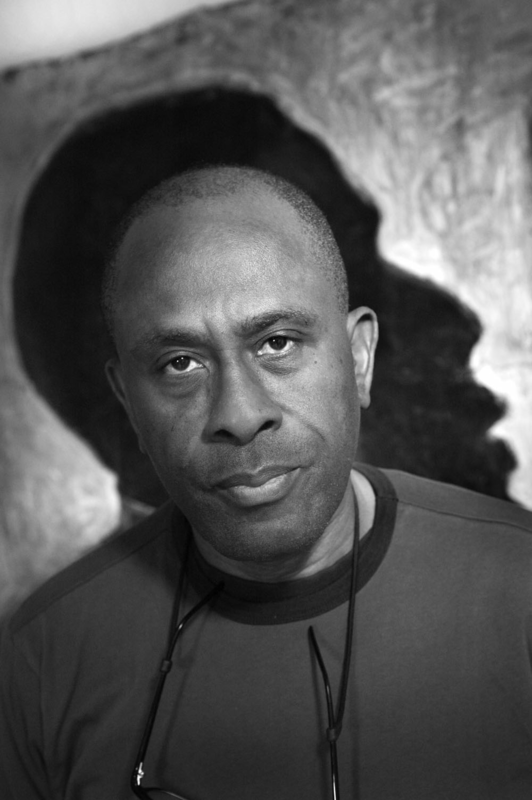 Victor Davson is a visual artist and founding director since 1983 of Aljira, a Center for Contemporary Art in Newark, New Jersey. Davson was born in 1948 in Georgetown, the capital of what was then British Guiana. Since immigrating to the United States in 1973, he has received a BFA degree from Pratt Institute, Brooklyn, New York; established himself in his practice as an artist; co-founded Aljira; and served as its director for 33 years. He is a graduate of The Getty Museum Management Institute and did his graduate work in non-profit management at New York University’s Gallatin School. Davson left Guyana for New York seven years after Guyana’s independence in reaction to a government that had become increasingly repressive as well as to free himself of his traditional, English art education. His art practice is heavily influenced by the anti-colonial politics of the Caribbean and by the intellectual powerhouses of that period, among them extraordinary writers and activists like Martin Carter, Frantz Fanon and Walter Rodney. Davson’s work has been exhibited widely throughout the northeast United States as well as internationally in Great Britain, France, the Dominican Republic and Cuba. His art is included in the permanent collections of the National Museum of Fine Arts, Havana, Cuba; National Collection of Fine Arts, Guyana; Newark Museum; Montclair Art Museum; New Jersey State Museum; Jane Voorhees Zimmerli Art Museum, Rutgers, The State University of New Jersey; and Morris Museum, among others. He has received numerous honors for his art: fellowships and awards include a Pollock-Krasner Foundation grant; a Rutgers Center for Innovative Print and Paper fellowship; and three fellowship awards from the New Jersey State Council on the Arts. Davson has been honored by Rush Phillanthropic, the Newark Arts Council and the Brodsky Center for Innovative Editions for both his work as a visual artist and his leadership in the arts. He received a leadership award from Prudential Foundation for his contribution to the Newark community. He was one of 15 non-profit leaders in the arts, nationwide, selected to participate in Leadership 2000, a program of arts and economic development training for outstanding community leaders, sponsored by the Lila Wallace-Reader’s Digest Fund and Manchester Craftsmen’s Guild, and administered by faculty of the Harvard Business School. Davson also has served on panels for the National Endowment for the Arts and the New Jersey State Council on the Arts. www.victordavson.com. Aljira’s operations and programs are made possible, in part, by the New Jersey State Council on the Arts/Department of State, a partner agency of the National Endowment for the Arts, New Jersey Cultural Trust, The Kenneth Aidekman Family Foundation, Bank of America, The Geraldine R. Dodge Foundation, Edison Properties, Newark Foundation, Horizon Foundation for New Jersey, Joan Mitchell Foundation, Lambent Foundation, MCJ Amelior Foundation, Merrill Lynch, Newark Downtown District, The New York Community Trust, Pharmachem Laboratories, Inc, PNC Bank, Prudential Financial, The Prudential Foundation, PSE&G Foundation, Newark Celebration 350, The Schumann Fund, The Turrell Fund, The Andy Warhol Foundation for the Visual Arts, and many generous individual contributors. Aljira is located at 591 Broad Street in downtown Newark. For directions visit our website at www.aljira.org. The Center is open Wednesday through Friday, 12–6 pm and Saturday, 11 am–4pm. Phone 973 622-1600, fax 973 622-6526, Website: www.aljira.org. On Instagram: @aljiraart. On Facebook: www.facebook.com/aljira. On Tumblr: www.aljirablog.tumblr.com. On Twitter: @aljiratweets.